In previous articles I’ve touched on the topic of preplanning what your list is for, who it’s for, and what you’ll be sending them. One method of figuring this all out is to “define your avatar” (as the Internet marketing folks put it). It’s actually a pretty good exercise, and I’ll tell you below the surprising way this topic came to my mind this week. Marketers use “avatar” to get you to come up with a mental image of your ideal client: who are you marketing to, specifically? (Hint: “Anyone with money” isn’t what they mean!) Are they more likely male or female? How old? What do they do for a living? What kind of car do they drive? Where do they live? Do they prefer Macs or PCs? Are they liberal or conservative? Are they tech savvy or newbies? Do they have children? What are their main problems in business/life/career? Things like that. The idea is to be pretty specific, and write it all down into a profile that you can “get to know” to help keep your avatar in mind. Why? 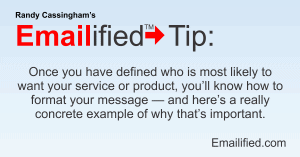 Once you have defined who is most likely to want your service or product, you’ll know how to format your message. The language, vocabulary, etc. you use will be different if they’re college-educated high-tech executives rather than tech-newbie blue-collar workers. Busy people will need shorter messages (and more repetition) than retired folks with lots of leisure time. It’s not that one is better than the other: the point is to figure out who your market is so you can make your messages the most effective they can be because they’re slanted to the sort of person you want as your customer. And it may change over time, or be refined. I read about a company that had a very clear avatar that helped in their marketing, and they then did a survey of their customers to ensure they had their demographics correct. They did, except for one thing: their customers skewed 10 years older than they had anticipated. They immediately reacted by changing their advertising to show people with a bit more gray hair, driving more classic cars, and they changed the background music to be from the decade before, to hit those nostalgia buttons. The result? A significant increase in sales. Their audience felt that the company was “talking to them” even more than before. That’s the power of knowing your avatar, so what is the avatar for your company? A friend of mine runs a very successful company, and I’ve heard her say on several occasions that her customers are “unsophisticated.” I didn’t quite know what that really meant until she showed me a paper letter she got in the mail at her company address, to the attention of “Manage Your Subscription”. The handwritten letter said, “I am getting too many emails. Please unscribe [sic] me. [Name redacted] [Email address redacted] Thank You”. Yes, really: she wrote a paper letter, put it in an envelope with a 45-cent postage stamp, to ask to be “unscribed” from my friend’s super-helpful business emails — and that’s what prompted this article: even though my friend understood that her audience is “unsophisticated,” this drove it home just what that means. Her customer didn’t click the “Unsubscribe” link at the bottom of every email, she didn’t reply to one of the emails asking for help, she sat down and wrote a letter and put it in the mail. That’s pretty unsophisticated! So how does my friend use this knowledge? No, she doesn’t talk down to her audience. Instead, she knows she has to be very careful in how she writes for them. She has to start with the very basics and build upon that foundation with everything explained, step by step. Imagine if she had assumed they already have basic knowledge about business, or online topics! She would have lost them from the get-go. They wouldn’t have understood what she was talking about, and quickly tuned out. Knowing her avatar has made her very (very!) successful, and this was a great reminder about how basic she needs to be with them. What’s your avatar? Knowing the answer — in detail — will help you focus your list messages.